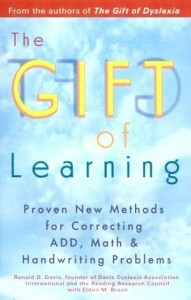 This book, written as a companion to The Gift of Dyslexia, provides a detailed overview and step-by-step instructions in methods for addressing math, attention focus, and handwriting problems. Parents and teachers who have been working with students using the Davis reading techniques will find additional exercises they can use to improve other basic learning skills. The book also includes a special section on motivation, which is the ultimate key to success with Davis tools. This section explains how to guide students to discover their inner needs and create their own goals that will provide the stimulus for success.